UK Pool & Spa Expo 2015 organisers have announced an all change strategy with a host of new features for the third instalment of the wet leisure exhibition that takes place later this month at Birmingham’s NEC. New staging for the Product Zone is being planned for visitors to view the latest products and technology at the entrance of the exhibition, while UKPSE organisers are creating a dedicated Wellness Area to highlight additional retailing opportunities. This follows the double change, announced after last year’s event, which will see the exhibition revert to its early dates of January 22, 23 and 24; while the larger Hall 10 at the NEC is accommodating the growing demand for exhibition stands as part of the event’s expansion. Also new this time round will be the ‘Central Hub’, which is replacing the previous Exhibitor Lounge and is set to be situated in the heart of the exhibition hall. It will incorporate a mix of visitor catering, an Exhibition Lounge, an open seminar auditorium and a media-hosted networking forum. There will also be a suitable area to speed network, and meet buyers, or simply a location to relax while sampling the refreshments. Exhibitors from the first two outings have continued to support the event, which will see the return of USA brands Alps Spas, Artesian Spas, Marquis Spas, Viking Spas and Vita Spa to claim exhibitor hat-tricks in 2015 alongside fellow USA manufacturing heavyweight Marquis who will be making a second appearance. High-profile ‘new recruits’ will include iconic global brand Villeroy & Boch, while Doric Marketing wet leisure guru Dorian Davies will also be making his debut as an exhibitor when the exhibition opens its doors to trade and consumer visitors. Special exclusive offers are being provided by exhibitors during the event including a ten per cent discount to holiday park operators by Artesian Spas, on Stand 320, for orders made at the exhibition. Viking Spas distributor Spa Solutions, on Stand 200, will also be providing an exclusive offer of 40 per cent off a sixth spa purchase when five Viking Spa models are ordered during the three-day event. Summit Leisure is taking ten per cent off all commercial grade spas ordered at the exhibition; while Allseas Spas is providing a free shower or step with every spa or swim spa order. Hydrospares, on Stand 204, is offering a ten per cent discount for those that pick up an online order code at the exhibition; as is Darlly Europe, on Stand 204; while BAYROL has pledge to knock 15 per cent off the list price of a BAYROL Compact Amperometric Free Chlorine & pH Controller; and ITS Europe Ltd is providing a free Pool Water Reagent Box, worth £46.99, with every purchase of a new iDip Smart Photometer, which is priced at £124.99. UKPSE Organiser Claire Saunders, who is Director of the New Events company that is promoting the exhibition, has revealed that great support for the event has resulted in the team cranking up their efforts an extra notch. “We have run two successful shows and now it’s time to take it up a notch,” said Claire. “Thanks to the great support from our exhibitors, the 2015 floor space is almost sold out, meaning we can really concentrate on making the show a valuable experience for our visitors. 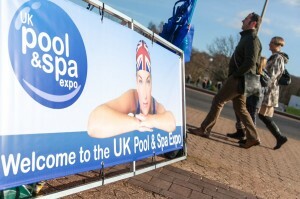 UK Pool and Spa Expo 2015 opening hours for the first two days of the show, on January 22 and 23, will be between 10am to 5:30pm. On Saturday, January 24, the third and final day of the UK Pool and Spa Expo is the Consumer Day that will be staged between 10am and 3pm for exhibitors in Hall 10 to meet with members of the public as well as trade representatives.